Size 3: 16 to 28 lbs. Size 1: 8 to 14 lbs. Size 5: Over 27 lbs. Size 6: Over 35 lbs. Size 4: 22 to 37 lbs. Size N: 6 to 9 lbs. 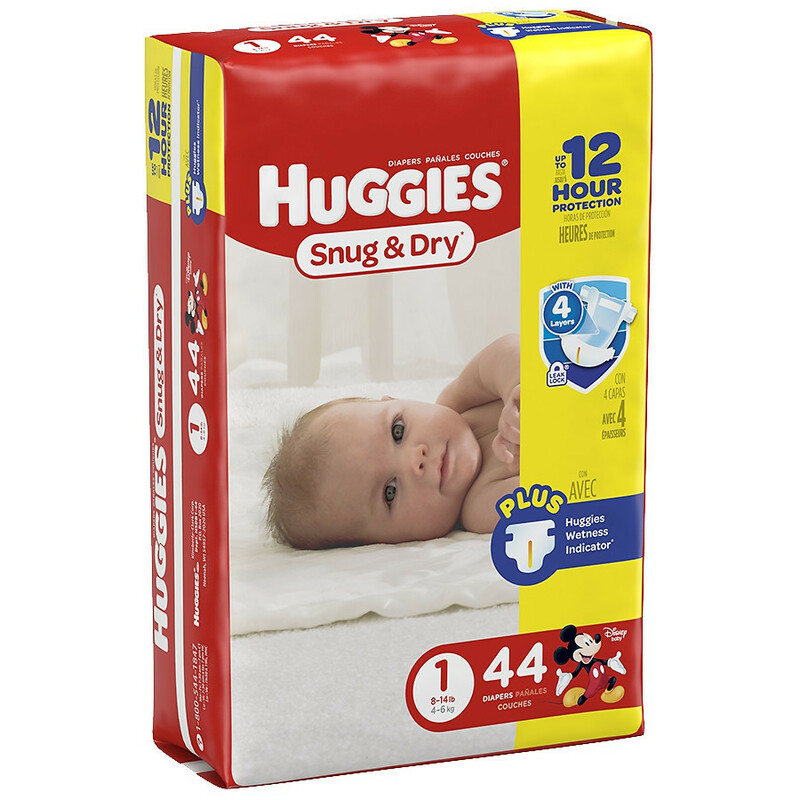 The Huggies Snug and Dry Diapers are disposable and heavy absorbent baby diapers. These diapers are used by newborns and children all the way up to 2 years of age. The diapers are available in a variety of different sizes so your baby can have a perfect fit during their early years of life. 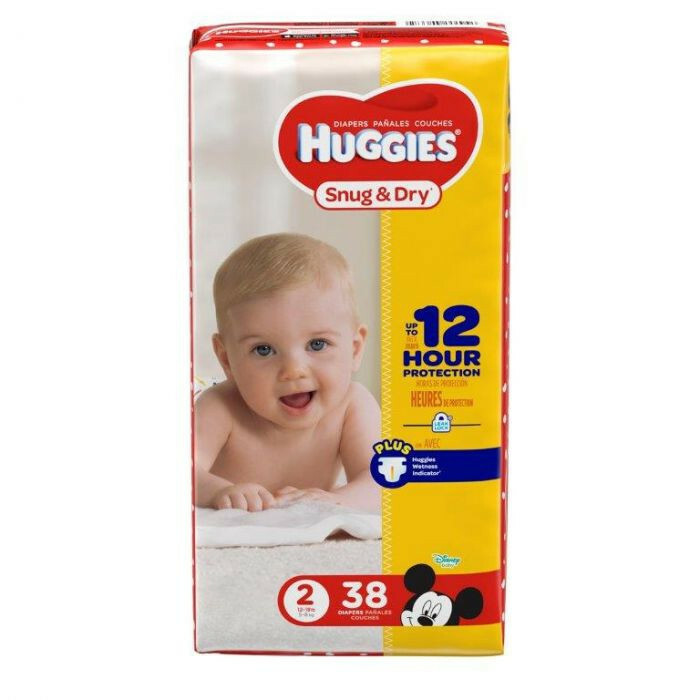 The sizes available for the Snug & Dry diapers are: N, 1, 2, 3, 4, 5 and 6. 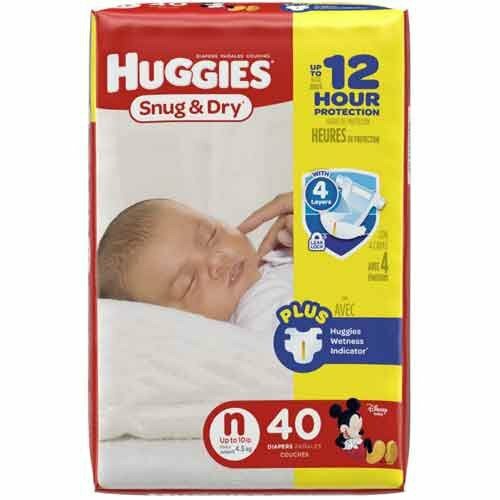 The Huggies Snug and Dry newborn diapers will accommodate infants up to 9 pounds and the largest size will fit infants that are 35 pounds. Each diaper has elastic gatherers at the legs to prevent leakages while still allowing your baby to be active. The four layer protection design ensures that the fabric will not break through once it gets wet or soiled. These diapers are designed with a refasten able tab that ensures a perfect fit, unlike other baby diapers that have regular tab closures. The Snug & Dry diaper comes with a wetness indicator that will change from yellow to blue to let users know when to change the diaper. Vitality Medical offers a variety of diapers such as the Comfees Diapers for more product options. Why such a huge price increase? Prices are subject to change and are due to several different factors, including directives from the manufacturer. Can not beat this price!!! With Blessing #5 on the way, I decided to spend more time bargain shopping. For quite some time I have known that you often find lower prices for a greater quantity at medical supply stores. I was shocked to see how inexpensive the Newborn diapers were. I was even more excited to see the total after apply a discount code. I would recommend this site 100 times over!!! I love the great price I got on newborn diapers! Also the shipping was fast. Love the price and fast delivery!